Astronauts Reid Wiseman and Barry "Butch" Wilmore floated outside the International Space Station Wednesday and, after a bit of trouble with a balky bolt, replaced a broken voltage regulator in one of eight solar power channels to restore the lab's electrical grid to normal operation. They then worked through a list of lower-priority tasks, removing a broken camera, installing a replacement at a different location and relocating a support mast and wireless transmitter assembly in preparation for spacewalks next year. U.S. EVA-28 got underway at 8:16 a.m. EDT (GMT-4) Wednesday when Wiseman and Wilmore, floating in the Quest airlock compartment, switched their spacesuits to battery power. The primary goal of the 6-hour 34-minute spacewalk was to replace an electrical component known as a sequential shunt unit, or SSU, that failed earlier this year, knocking out one of the eight solar power channels in the station's NASA-built electrical grid. The space station is equipped with eight 110-foot-long solar wings that provide power to eight distribution channels. Each array is equipped with a sequential shunt unit to regulate voltage as the station moves into and out of Earth's shadow. The SSU in power channel 3A failed May 8, forcing flight controllers to re-route power from channel 3B to keep a variety of components in operation. The EVA timeline was set up to ensure that Wiseman and Wilmore could remove the faulty SSU during a night pass when the arrays were not generating power. 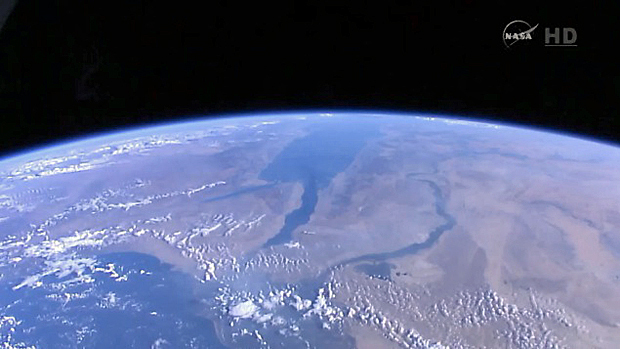 A few moments before passing into orbital darkness, the spacewalkers were treated to a spectacular view of Egypt, the Nile river and the Red Sea passing by 260 miles below. "I see Cairo, can't quite make out the pyramids, though," Wiseman observed. Working in darkness at the far right side of the station's solar power truss, at the base of the channel 3A solar array, Wiseman was initially unable to drive open a bolt holding the faulty SSU in place. Using a ratchet wrench and a bit of elbow grease, he successfully "broke torque" on the bolt and pulled the shorted SSU out of its mounting bracket. He then ran into problems bolting down the replacement. "I still see nothing. No movement," Wilmore observed, watching an indicator that should have shown the SSU locking in place as Wiseman tightened the bolt needed to secure it. "OK, let's keep track of the turns, try to find that sweet spot where the bolt will align with the receptacle," astronaut Ricky Arnold radioed from mission control in Houston. "OK. Let me just talk about this, Ricky," Wiseman said. "The bolt is definitely in. If I pull up on this (SSU), it's not moving. I've got 9.9 turns (on the bolt), but we haven't seen any closure." Arnold told the spacewalkers to back out the bolt, remove the box and inspect it for damage or any obstructions. Wilmore reported a possible broken thread at the base of the bolt, but he wasn't sure. After a bit of discussion, flight controllers told the spacewalkers to re-align the box and try again, putting more force into it than before. This time around, again using the manual ratchet wrench, Wiseman was able to tighten the bolt all the way. A few moments later -- just two minutes or so from sunrise -- flight controllers tested the circuit and reported the replacement SSU was working normally. "Woo hoo!" The spacewalks exclaimed. The astronauts then pressed ahead with work to move a camera support mast from the lower side of the port-1 solar array truss segment to the top of the forward Harmony module. The relocation is required to clear a path for work next summer to robotically move a storage compartment from the bottom of the central Unity module to the forward-facing port of the left-side Tranquility module. First, Wiseman had to remove and temporarily stow a camera on the stanchion that has a stuck zoom lens. The stanchion then was disconnected, carried by Wilmore to the upper side of the Harmony module for installation at camera port 11. While that was going on, Wiseman disconnected a wireless transceiver assembly from the top of the left-side truss at camera port 8 so it could be attached to the stanchion installed atop Harmony by Wilmore. The transceiver is used to relay views from spacesuit helmet cameras. But Wilmore ran into problems bolting down the stanchion. Free floating, he was unable to get enough force on an attachment bolt to get it to engage the mounting bracket. "Over there, we couldn't get it off. Over here, we can't get it on," Wilmore said. "This is just a tough worksite." Wiseman moved up to help and finally, after several attempts, Wilmore was able to drive the bolt home. "It feels like it is in tight," he reported. "It's not going anywhere." He then connected the wireless transceiver assembly, which will improve communications during a series of planned spacewalks next year to prepare forward ports for dockings by new commercial crew ferry craft. Wiseman then carried the camera with the stuck zoom lens back to the airlock, retrieved a fresh camera and working together, the two spacewalkers installed it on the top of the left-side truss where the wireless transceiver had been located. The spacewalk included a half hour for a variety of so-called "get-ahead" tasks that could be carried out if time was available, but flight controllers opted to end the excursion on time after the camera installation. After collecting their tools and other gear, the spacewalkers returned to the airlock and began repressurization procedures at 2:50 p.m. It was the second in eight days for the U.S. crew after a spacewalk last Tuesday by Wiseman and Alexander Gerst to relocate a broken cooling pump, to replace a camera light and to install a component to provide backup power to the lab's robot arm transporter. Overall, it was the 183rd spacewalk devoted to station assembly and maintenance since construction began in 1998, the sixth of seven EVAs planned for this year, the second for Wiseman and the first for Wilmore, a former shuttle pilot. With today's spacewalk, 119 astronauts and cosmonauts representing nine nations have logged 1,148 hours and 49 minutes of station EVA time, or 47.9 days. The year's seventh and final planned spacewalk is scheduled for Oct. 22 when station commander Maxim Suraev and Alexander Samokutyaev plan to jettison no-longer-needed gear and carry out a detailed photo survey of the Russian segment's exterior. NASA plans eight to 10 station spacewalks next year to prepare the lab for dockings by Boeing and SpaceX commercial crew ferry craft starting in 2017. When the work is complete, the U.S. segment of the station will be able to accommodate two commercial crew vehicles and two U.S. cargo ships at the same time, giving NASA fully independent access to the orbiting laboratory for the first time since the shuttle's retirement in 2011.